Social Engineering is Alive and Well. How Vulnerable is Your Organization? People are Vulnerable. Remind Them to be Conscious of, and Ready for an Attack. In the past, I have called Social Engineering the “art of creative deception,” and other security people have used similar words over the years. The truth of the matter is that anyone with some intestinal fortitude can do social engineering. Although a great technical mind is not necessary, it does help identify risks. As a matter of fact, social engineering is a significant component of a dedicated attack, and is definitely included in an Advanced Persistent Threat (APT). What ultimately makes a social engineering attack work is simply human nature. We want to trust and help people, most of us dislike the idea of being rude to someone. So, when someone calls or emails with a problem, we try to help. Many of us lack that human firewall that makes us wary of requests for help or information. Although I had never believed it for a minute, the ploy was very good; the young lady who answered the phone was perfect. She really sounded like she was in a call center, and she very well may have been. It made me wonder what percentage of people who got the same email I did went through the entire call, gave up their SSN and whatever else they were asking. I had the credit card company issue me a new card just to be sure. Three phone calls in less than 10 minutes. With the admin passwords I got from Chip’s email, we were through their perimeter within 30 minutes of my first call, and had effectively compromised their primary website, retail website, production database, firewall, and primary domain controller. Those are a lot of results for three phone calls that required limited technical skills. A true dedicated attack, like an APT, will use these techniques as well as many others. You can expect email attacks to be in the mix as well. During one of our tests, I sent emails to a total of 68 contacts from the client, and got 52 responses that gave us useful information - that is a 76% hit rate at a company that had a formal security awareness program. Among the 68 people we contacted, only one responded that we looked suspicious, and not one target reported our contact internally. Not one. And we were not really very sneaky about it either. For a test against the “ACME” company (names have been changed... you know the drill) we sent emails from an account named something like [email protected]. In a series of email exchanges, we were able to obtain group names, phone numbers, street addresses, full names, job titles, usernames, applications used, operating systems and versions, IP addresses, and even got one user to email back their login password. We learned that they were closing building 516 before most of their employees knew it. That information alone helped us get the password on their main Cisco router. We were not authorized to send in "hostile" attachments, but if I can get someone to email their IP address and password so I can "troubleshoot suspicious activity coming from your computer," then talking them into running an attachment would have been simplicity itself. Email. Gotta love it. Think this would not work on you or your company? Have you tested yourself? I suspect you would be very surprised. Each of the two companies above thought they were bulletproof. They each had formal security awareness training programs, a very savvy technical staff, and active security personnel. As a matter of fact, in each case intrusion testing and war dialing turned up nothing significant to attack. If we had stopped there they would have gotten solid grades. Unfortunately, or maybe fortunately, we added the social engineering testing and exposed serious gaps in their security. The social engineering tests provided detailed information so that the subsequent technical attacks were able to succeed. If you have not tested your resistance to an attack that includes social engineering, it is worth considering. 1. Contract it out. Your own people have an advantage since they know too much about the company. They are also at a disadvantage because they will play by the rules. Chances are your own people would not push the envelope, or try the little things that help make such an attack effective. Social engineering is a rather unique skill that requires a certain amount of nerve. Personally, I found the attacks very stressful. Calling up staff, lying to them, and blustering or cajoling them into doing something wrong is not something that comes natural to most sane people. 2. Set the ground rules. What is attackable and what is not? Are phone, email, fax, and social media all in play? Can the contractor email in a “virus” or executable attachment (or a fake one)? Can they call employees at home? Is a physical intrusion attempt acceptable or not? Make the rules as broad as you can to make the attack as meaningful as possible. 3. Make it a comprehensive test. 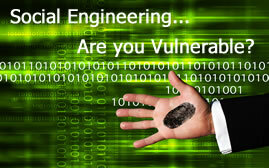 Don’t just contract for a “Social Engineering” attack. Pair it up with technical attacks. The social engineering results can feed technical attacks, which can in turn provide more fodder for discussions during additional technical attacks and data gathering. The more each part of the test learns, the more the other side of the test can use to be more productive. The whole really is greater than the sum of its parts. It is worth repeating that there is no such thing as a personal firewall that would help stop people from doing stupid things like emailing their password to a total stranger. But what we can do is know that our people are vulnerable, and remind them to be conscious of, and ready for an attack. A little vigilance never hurt nobody.